Sinfonia Chorale’s 50th anniversary year began with a superb concert at St. Giles’ Church, West Bridgford. The main work in the programme was Lauda Creatoris, composed by our Musical Director, Richard Roddis. This was very well received by both audience and choir alike. Now, of course, rehearsals are in full swing for our Christmas performances. On Sunday, December 11th the choir will be singing at Patchings Farm Arts Centre, Calverton NG14 6NU. Details and tickets for this are available from Patchings Tel: 0115 9653479 or from their website. 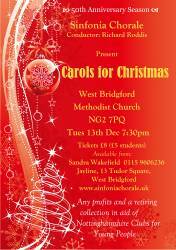 The following Tuesday, December 13th we shall be singing at West Bridgford Methodist Church, Musters Road NG2 7PQ starting at 7.30pm. 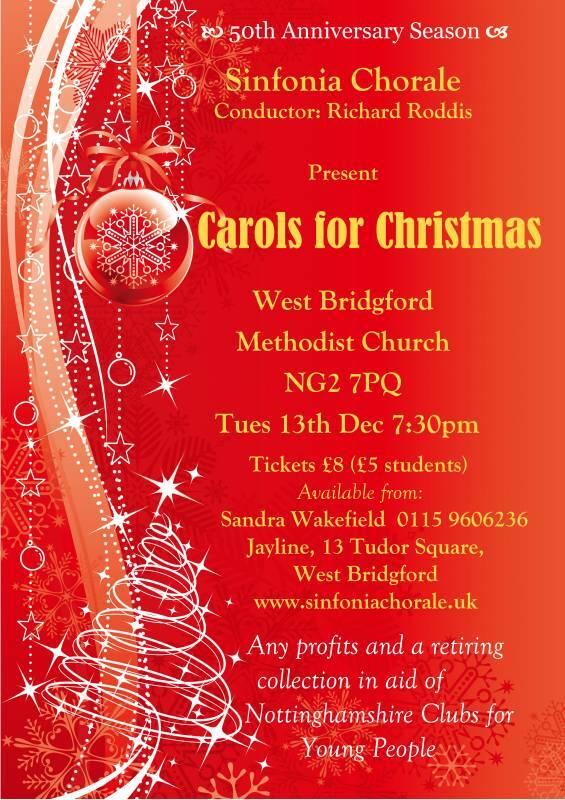 Tickets are £8 and £5 for full-time students, available from Sandra Wakefield, Tel 0115 9606236, Jayline, Tudor Square, West Bridgford or from the Sinfonia Chorale website. At this concert there will be a retiring collection in support of the Nottinghamshire Clubs for Young People. The programme will contain the usual mix of Carols old and new, along with readings and, of course, audience participation. Information and booking forms are available from the Sinfonia Chorale website. Anyone who has been to these workshops before knows what stimulating and satisfying occasions they are, so we do hope you will come and join us. On 11th March 2017 we have our major celebration concert in the magnificent surroundings of Southwell Minster. We shall be performing Bach’s Mass in B Minor. The Baroque Ensemble will be led by Nicolette Moonen. Tickets are priced at £15, £12 and £10 and will be available in January from the usual outlets. Do come and join us for what promises to be an exciting event. It will be a great opportunity to hear this magnificent piece performed with the kind of resources that Bach himself would have used – a chamber-sized choral group accompanied by Baroque instruments. As usual we thank you for your continued support and hope to see you at our future concerts. We wish you a Happy Christmas and send our best wishes for 2017.